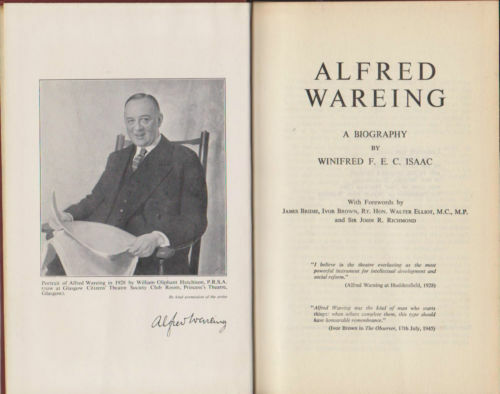 Alfred Wareing (1876-1942) was a theatrical producer, probably best known for being the first to run a repertory company in Glasgow (although he was only there from 1909 to 1913). He wrote its manifesto (the company was called the Scottish Playgoers Co. Ltd) and the later Citizens Theatre adopted its own name from what Wareing wrote. From 1918, and certainly through the 1920s, Wareing built a reputation for ambitious theatre as the driving force behind the Theatre Royal in Huddersfield (among his lead actors was Robert Donat).